I imagine it will take us a little while to get into our cooking groove here - new stove and oven, different ingredients and textures. One of our first nights here I cooked green beans and had to boil them for what seemed like an eternity before they were tender, though it could have been the terrible cookware we're using until our stuff arrives from the States. We bought lamb chops the other day and discovered we had to French the bones ourselves. And if anyone has any tips on cooking halal meat so it doesn't smell weird, it would be much appreciated (seriously). This was the first meal I made where we actually remarked, oh this is pretty good. It was the first meal where I looked at things in the market and figured out how to do something a bit more interesting with them. First, the fig and camembert pizza was delicious and a great thing to make with two ubiquitous Algerian ingredients. We chose an recipe for a simple unleavened dough, but if you have time a standard pizza dough would have a bit more spring to it. On a side note, the baking pan we're using warps so terribly in the oven that the cheese completely ran off half our pizzas from the practically 90 degree angle. We'll be happy when the pizza stone arrives. Secondly, given the amount of good tomatoes and the hot weather, gazapacho seemed in order. 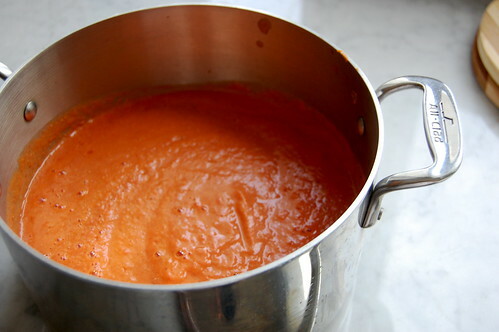 Salmorejo is a variety of gazpacho distinctly named because it involves almonds and toasted bread. (Kind of like one of my other favorite kinds of gazpacho.) It's super simple to make, no cooking required, and has a really great texture. We topped ours traditional-style, with chopped hard boiled eggs. These two items, eaten on the patio with a class of chilled rose, make for a great summer meal. Very loosely adapted from Bon Appetit. 1. Place flour in a bowl and sitr in the salt. Drizzle the olive oil over. Slowly add the water, stirring with a spoon until the mixture comes together as a dough. Knead the dough a few times in the bowl until it is smooth, adding extra flour to keep from sticking if necessary. Cover the bowl with a damp towel or plastic wrap and let rest for 2-3 hours. 2. Meanwhile, heat some olive oil in a pan and saute the onion over medium-low heat until it is soft and starting to caramelize. Set aside. 3. Preheat oven to 450 F. Working on a lightly floured surface, separate the dough into about 6 balls. Roll out the dough on a lightly floured surface into small rounds. Transfer to a greased baking sheet. Top each dough round with some caramelized onions, then several slices of camembert. 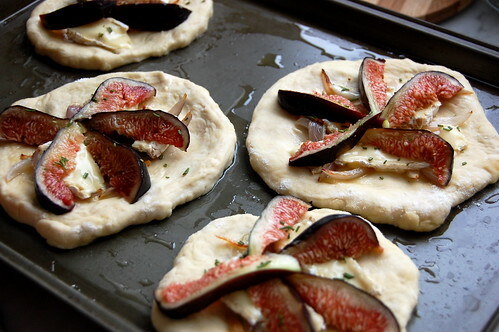 Arrange the fig slices in a pinwheel formation on top and sprinkle with rosemary. 4. Bake for 6-8 minutes, or until the crust is firm on the bottom, the cheese is melted and bubbling, and the figs have gone soft and caramelized. Enjoy immediately. I recommend the blender, not the food processor, for making this soup. If you don't have Sherry vinegar a splash of lemon juice will do. 1. Place a fine mesh sieve over a bowl. Halve the tomatoes and use a knife to scoop out the seeds/pulp of the tomatoes into the sieve. Using the back of a spoon, press the seeds against the sieve to extract all the juice. Discard seeds. Chop the tomatoes and add to the bowl with the liquid. 2. You may have to work in two batches to do the following, if so try to divide the ingredients evenly in each batch. Add the tomatoes and their juice to the blender. Add the salt, garlic, chopped bread, vinegar, and almonds to the blender. Blend the mixture well in the blender. With the blender running, add the olive oil in a slow stream from the top hole. The emulsion of the olive oil will lighten the color of soup slightly. Place the soup into the fridge and let chill for at least 2-3 hours. 3. Ladle into bowls and top with your topping of choice. I'll soak lamb in milk for a few hours (or overnight) to reduce gaminess sometimes. Works with fish too. And a friend of mine always rinses raw meat in vinegar (or lemon/lime juice) before cooking to cut the 'meat smell'. Hope one of those helps with the weird smell. Yum! I love any combination of figs and cheese. We are lucky enough to live in a neighborhood with lots of fig trees. Will have to try this once our figs are ripe. Sounds delicious. I love any combination of figs and cheese. Will have to try this particular one when the figs in my neighborhood ripen this September.